… but all that tristezza scura disappeared when I happened to notice the sasanqua in Full Autumnal Bloom on the aia as I progressed with My Inspection of il Poggiolo. Dogs in attendance too. Gads, I suppose, in this case? Here, no need to stoke the fire to keep warm. No fireplace. Just radiators to program to turn on & off automatically, as per your pleasure. HATE the bills which come for that. Lots of light though. Views too. Port & ships & seagulls. Plenty of open space. WOW!!! Our Genoese residence and My Headquarters for the past three weeks. And yes, that stool has ONLY three legs. But what a far cry from il Poggiolo!!! Its complete opposite. How did that happen? Cannot resist the absence any longer. It must be the Blue calling. Dogs, clean & folded laundry & My Esteemed Self will squeeze into the FIAT Barchetta and saunter on down on Monday morning to Codiponte at 90 kph… a method to save spending one’s inheritance at the pump. I am sure the yard will need tending to. And, it will be, just as soon as I can get a fire going in the fireplace in the Appartamento Azzurro. The Dogs LOVE warm. It’s supposed to rain. Fine. We’ll be cozy. Gads. So far, there are two posts… one about pottery shards I found while renovating a cantina… to be an artist’s studio… in a 16th Century single-family palazzo I had bought years ago in the Historic District of Genoa. The other, just posted, is about the monumental Cemetery of Staglieno, also in Genoa. Check them both out. There are videos too! Gads. Here’s a shot of how Codiponte looks when it really, really rains and, apparently, that is all it has done since Noon yesterday. The Heavens let loose a wall of rain all yesterday… Saturday… afternoon & night in the Lunigiana. By Midnight, Mother Earth could take no mo’ water. She let loose a series of mud & rock slides… several along the critical communication route of the Strada Statale 445… which summarily cut Codiponte off from The World… well, Gragnola and all west. The Aulella River tipped its banks at some point late last night and put all those cleverly built houses in Codiponte’s flood plain under water. Folk worked through the night to save the offices of the Croce Bianca… an important local ambulance service… housed in one of those Flood Plain Houses. Others fought to save other residences & shops in the village proper from the high waters of the stream which cuts the village into two at the Piazza Civico. I can imagine lots of flooded cantine. Not good for salami, formaggi e legno. 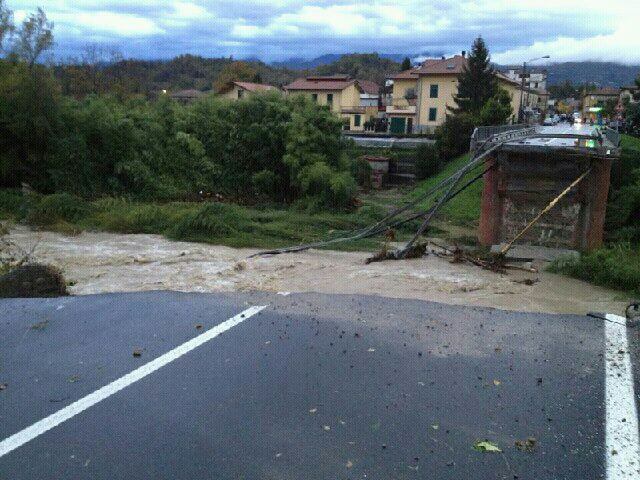 Real Disaster struck when a key bridge in the village of Serricciolo… one of three towns you have to pass through to get to Codiponte from Aulla… washed away early this morning. In a few brief seconds, most of one part of the Lunigiana was cut off from the other throwing in the Rest of the Known World for Good Measure. I am waiting another call from My Dutch Friend to tell me how il Poggiolo took all that water. And, if I have to go, how can I get there? Gads.